In this Rktcr editing tutorial, I'll talk about how to create disruptable platforms and gems. These are platforms and gems that only one of the vehicle's wheels collide with. This tutorial assumes knowledge of the editor basics. If you own the full version of Rktcr (and, really, you should), you can grab this level pack to follow along. In this tutorial, we'll make a level where the player needs to navigate out of the a starting box by letting the front wheel fall through one segment and the back fall through another. After this, the player will need to pick up the final gem with the appropriate wheel (lest it be knocked into the abyss). 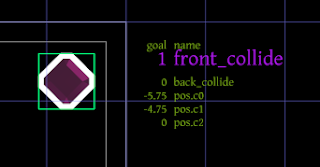 First, we'll make the two short segments in the bottom of the starting area disruptable by going into property edit mode (select, shift-tab), selecting collide (up/down, then enter), and changing the value to 1/2 for the left/right segment (delete, 1/2, enter). 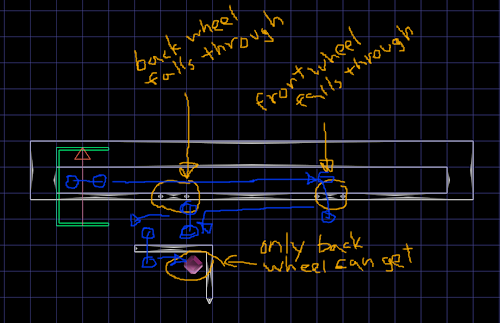 The polygons will now be highlighted in white/gray, indicating that the front/back wheel (only) will collide with them. 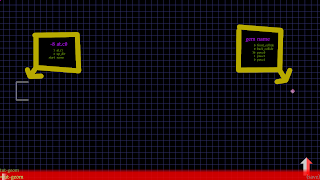 Of course, it never hurts to actually check by playtesting the level (select start portal, then press enter). The gem will be surrounded with a white band to indicate that the front wheel collides with it. As before, you can always confirm that things are working as you expect by playtesting. 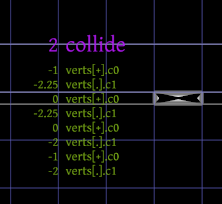 In today's rather short tutorial, I showed you how to make disruptable platforms by setting the collide property on level geometry, and how to make disruptable gems by setting that front_collide and back_collide properties on gems. 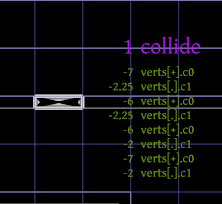 It is worth noting that -- though we did not do so in this tutorial -- you can also change the collide property on dynamics. 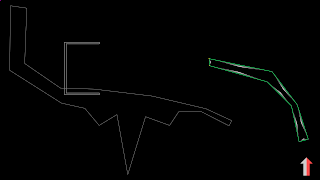 Disruptable platforms and gems can lead to situations where players need to carefully consider the vehicle's orientation. They can add challenge to maze-like levels and also allow for tricky momentum-conservation strategies (like letting the wheel that does not collide spin around the one that does). I've covered nearly all of the features of the Rktcr editor. The only tutorial subjects that remain are bursts; style layers; and claims. In this Rktcr level creation tutorial, I will describe how to add dynamic (i.e. 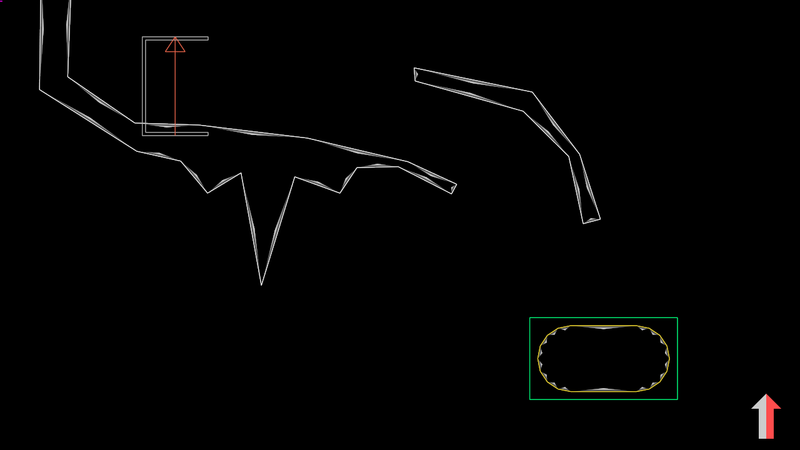 physically-simulated) geometry to levels, and how to add constraints between these dynamic bodies. This tutorial builds on ideas introduced in the basics and geometry tutorials. And, as before, you'll need the latest full version of Rktcr (v3.1 as of this writing). 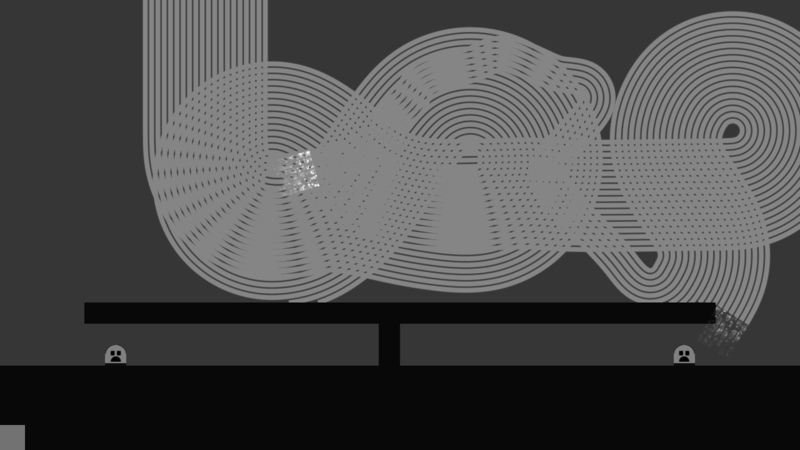 In this tutorial, I'll start with some existing static geometry, and make some of it dynamic. Above, you can see the plan I'll be following. If you'd like to follow along, you can download a zip file containing this level (along with the finished version) here. Place the files in your ".rktcr/e_levels" folder, start Rktcr in edit mode, and load tut-dynamics with f4. In Rktcr, all dynamic bodies are created from static geometry, much in the same way smoothed polygons are created from regular polygons. Select the static geometry you'd like to make dynamic with right-click, press space to open the creation prompt, type dynamic (or dtab, if you're feeling lazy), and press enter. seed is the seed for the (somewhat randomized) convex decomposition algorithm. If you don't like how the dynamic is being split into red and green regions, change this. gravity is the direction of gravity effecting the block (0-7 are fixed, 8 is "down relative to the current view"). density is what it sounds like. If the object seems too heavy, use something lower. 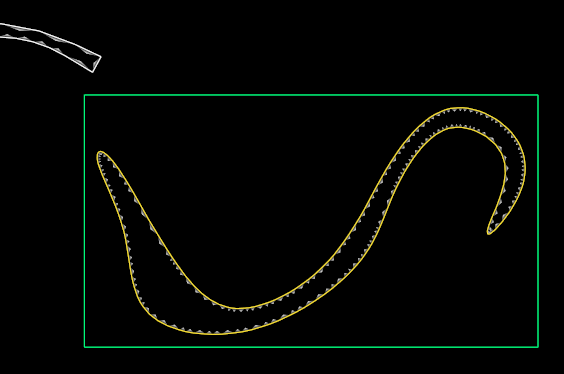 moment_factor scales the moment of inertia. Increasing/decreasing will make the object spin less/more easily. rel_pos is a starting offset for the object as (x,y,theta). It don't recommend using it. When working when dynamics, save often! 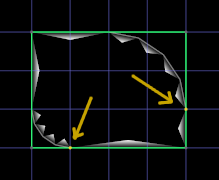 Sometimes, the convex decomposition produced by Rktcr's code can contain degenerate polygons, which -- in turn -- will make Box2D (which Rktcr uses for simulation) assert() when you attempt to test a level. At this point -- be sure to save! -- you can press enter to go into physics test mode. (If you end up in play test mode, it's because a portal side was selected.) 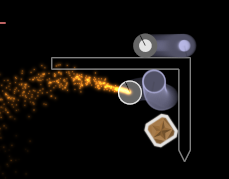 In physics test mode time runs inexorably forward, and you can grab and pull on objects using the mouse. Physics test mode will be useful as we create our various constraints. 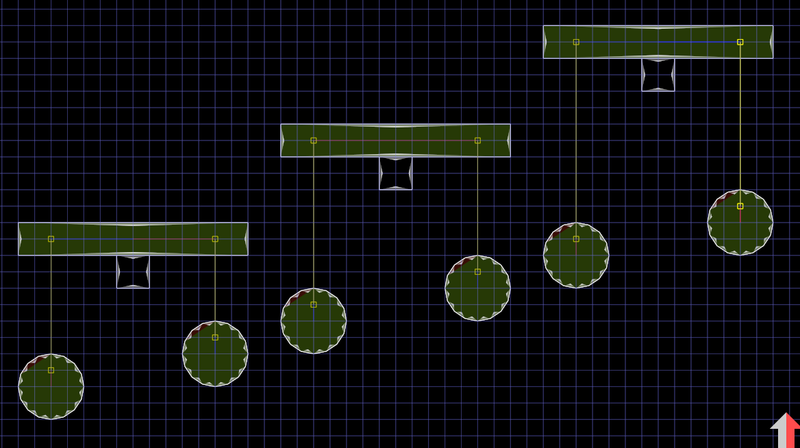 Plain dynamics bodies are fine for creating stacks and tippy platforms, but for the sort of stunts we have planned for this level, we need some physics constraints. Physics constraints are created in the Rktcr editor by pressing c. This creates a constraint between the current dynamic selected and either the previous two dynamic selected or (if the previous selection wasn't a different dynamic) the world. For the hanging circles in the level, we want the constraint type rope, which prevents the constraint points from getting further apart (but does allow them to get closer). 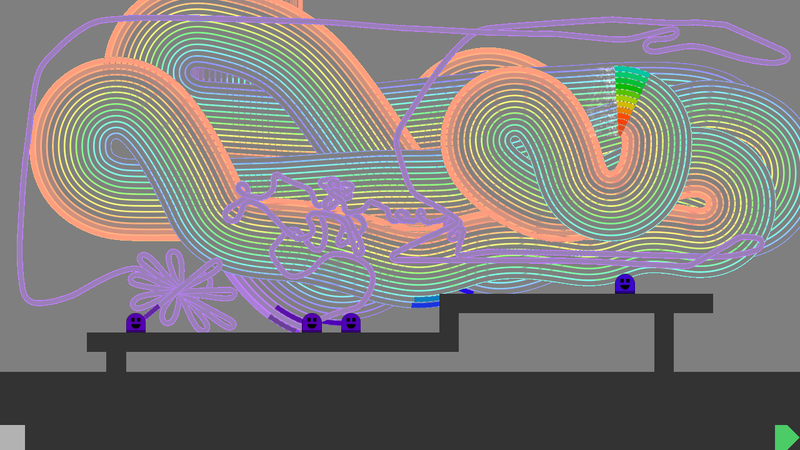 Let's finish up the rope constraints. Keep in mind that x can be used to delete constraints, and make sure to set the constraint type to rope (using edit mode -- tab). Also, I find that using the size-1 grid (1) and holding shift (snap to grid), helps to keep things aligned when moving constraint endpoints. 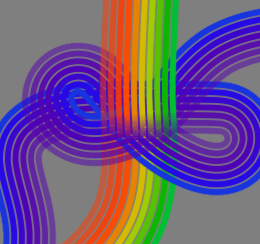 Note that the red/blue color of the lines connecting a constraint to its adjacent dynamics depends on the order in which they were selected, and isn't important to the actual simulation (so if yours don't match mine, don't worry). At this point (and after saving), you can drop into test mode with enter and make sure everything moves how you want it to (e.g. 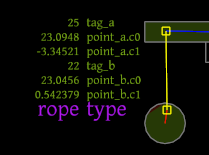 try dragging the circles with your mouse to get a feel for the rope constraint). 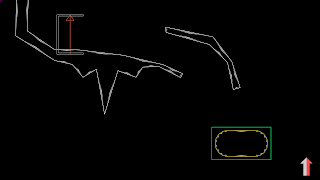 The first stunt in the level uses rod constraints. Create these as before, but make sure there is no previously selected dynamic by right-clicking on the c-shaped piece twice before pressing c. If you do this properly, one end of the constraint (the one connected to the world) will show as an x instead of a box. 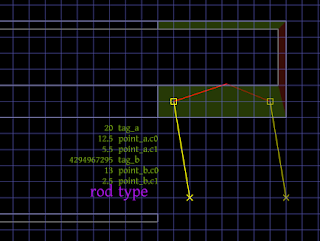 Also, make sure to set their type to rod in edit mode (tab). 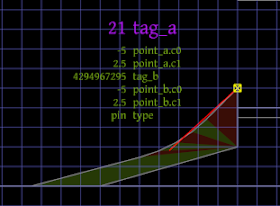 The constraint's type should be pin by default, but it doesn't hurt to hit tab and check. Generally, it's good to playtest levels as you go along, but I elided that for the sake of this tutorial. So, the question becomes: is this a winnable level? 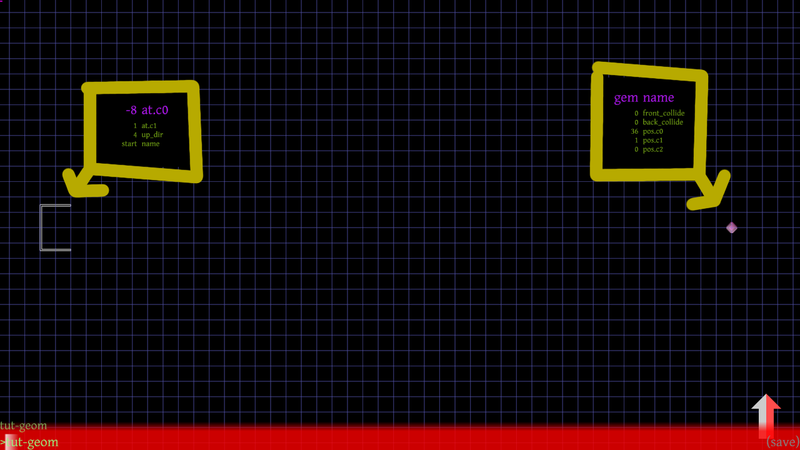 Well, the last part is quite tricky (removing the circles might be a good idea), but, yeah, it is possible. Dynamics are one way to add excitement (and chaos) to a level, but certainly not the only way. In upcoming tutorials, I'll talk about other methods, including working with disruptable platforms and gems; and adding bursts. I'll also go into making your level prettier using style layers; and giving folks a par time using claims. 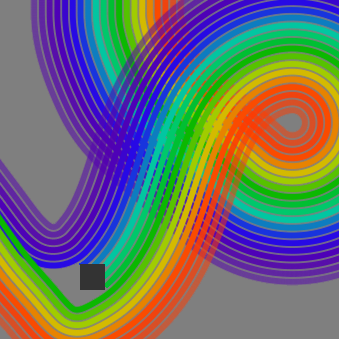 The HTML5 version of Rainbow features vibrantly colored Rainbows; when porting to C++, I traded off a bit of the brightness of the rainbows for softer intersection behavior. 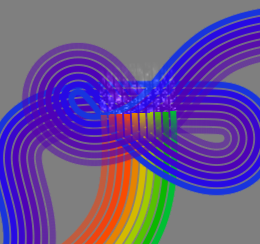 This weekend, I set out to brighten the bows in the C++ port, while retaining nice bow intersections. As you can see, the C++ version has been improved to have bows as bright as the HTML5 version. 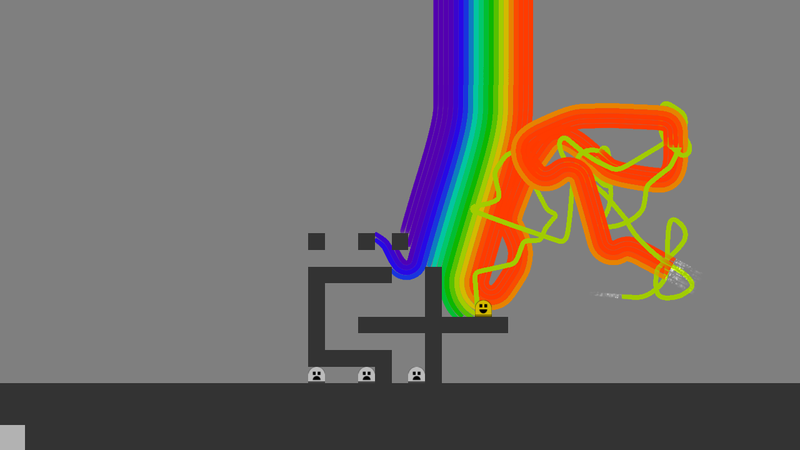 In Rainbow, the player can split the rainbow they control into multiple "fronts" and drive these fronts separately. 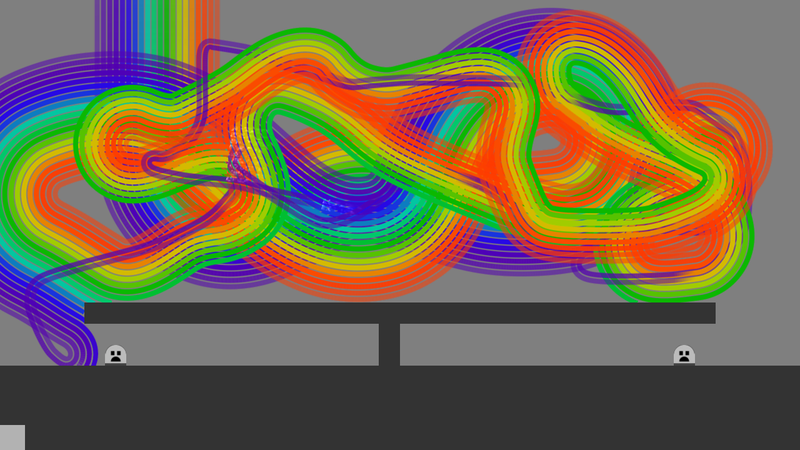 Each front leaves a rainbow trail. Trails freshly produced by a front should draw over older trails. Fronts should always remain visible. No hard edges should be introduced. To justify briefly: (1) arises because I want players to see what they are currently controlling; (2) is important because players should be able to see how much rainbow they have left; and (3) just seems like how magical rainbow substance should behave. 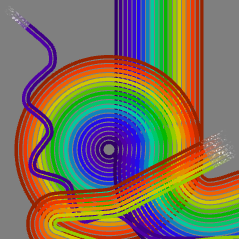 In the HTML5 version of Rainbow, the entire rainbow is redrawn each frame with each vertex's depth set based on the number of ticks from the beginning of the rainbow. This method actually fails all three of my ideal conditions in some cases, e.g. when drawing with an older front. In the C++ port, the rainbow is accumulated into a framebuffer. This pretty much guarantees that condition (1) holds. Condition (2) is satisfied by always drawing (but not accumulating) the very front of the bow over the top of everything in a different rendering pass. Unfortunately, because it draws over each of the old positions with the same opacity (alpha value) -- set, in an ad-hoc way to 1/8th -- the effective opacity of the bow is only about 73%. I.e. location a will be drawn into by segment 1, and then no others; location b gets drawn by 2 then 1, location c by 3 then 2 then 1, and so on. This passes some basic sanity checks -- if we want 100% coverage after segments (1-3) are drawn (i.e. αtarget = 1), we need to draw segment 4 with 100% opacity (i.e. x = 1). Also, if αnext is greater than αtarget then we get negative values -- which makes sense, as segment 4 can't prevent the subsequently drawn segments from covering the location, so it needs to attempt to preemptively remove coverage. 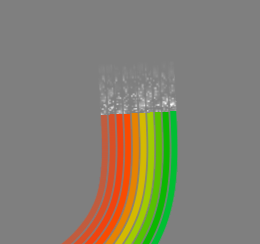 Since I'd like the rainbow to smoothly fade in from a cleared start, I chose a "fade" opacity value, f to vary smoothly from 0% coverage (at the trailing edge of the oldest segment) to 100% (at the leading edge of the newest). I was a bit worried about having a divide in the pixel shader, but profiling on iOS shows negligible effect on frame time. Since all of this math is actually done on 8-bit color values, some inaccuracy (and banding) does result. I could avoid this (and the above-mentioned divide) by doing the computation of x with a look-up-table that takes these errors into account. However, the artifacts are not so severe that this is a high priority. Before settling on the present solution, I tried all sorts of other ideas including multi-pass rendering and different blending modes. While none of them were what I wanted, they did produce some interesting pictures. In this Rktcr level editing tutorial, I will talk about the different kinds of level geometry available to you in the editor. I will assume familiarity with the basics of Rktcr level editing. You can grab the level pack for this tutorial here. The 'tut-geom' file is the starting point and the 'tut-geom-finished' is the finished level. To make us of them, place the files in your ".rktcr/e_levels" folder, and load into the editor using f4. 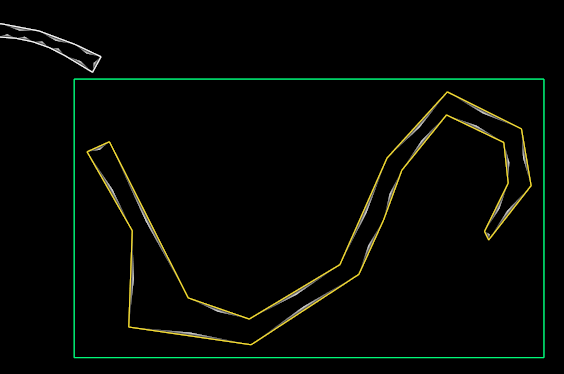 poly -- create basic straight-line polygons. Workhorse geometry, covered in the basics. Reviewed below. arc/[->arc] -- create/[turn selected polygon into] arc-gon -- a polygon where each corner is replaced by a circular arc. Covered below. smooth -- create a subdiv-smoothed version the currently selected polyon. Covered below. dynamic -- create a dynamic (rigid body) version the currently selected polyon. Will be covered in a later tutorial. side -- create a portal side. See the basics. gem -- create a portal side. See the basics. 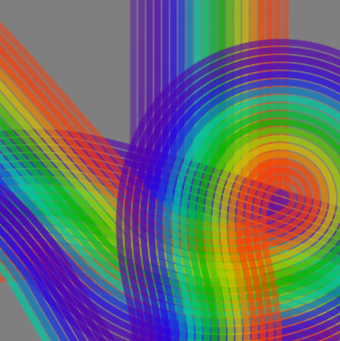 paint, ppoly, ppoly* -- functions relating to level-set-painting geometry. Covered below. 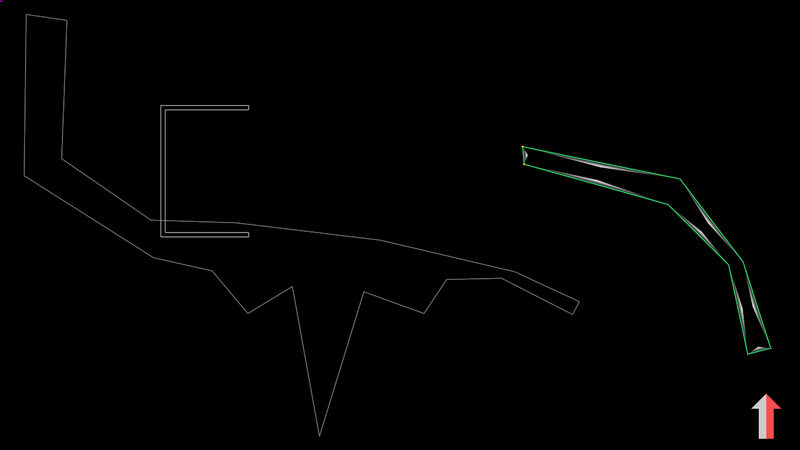 First, let's create some polygons; they are a good fundamental starting point, after all. Additionally, the polygon editing controls remain useful for arcgons and smooths. The controls for polygon creation are explained in detail in the basics, but to briefly review: tab to toggle edit mode; right-click to select, shift right-click to multi-select; grab, scale, and rotate to move verts; extrude and divide to create more verts; x to remove verts. 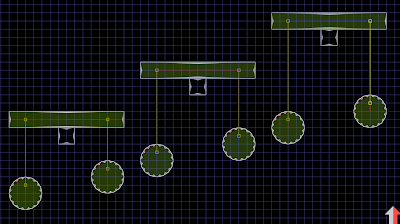 Now let's add some arc-gons to the level. Create an arc-gon using the prompt and drop into edit mode (Space, arc, enter, tab). 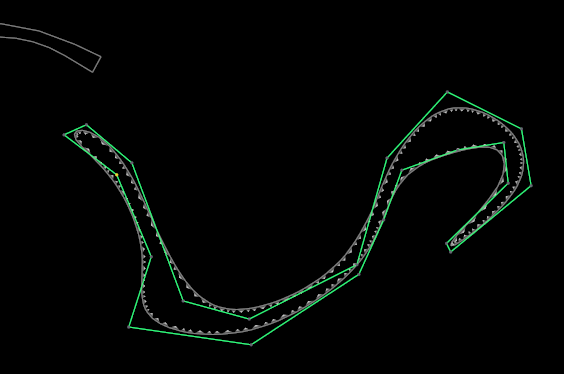 All the polygon editing controls still work, but now apply to the "cage" around the actual arc-gon. 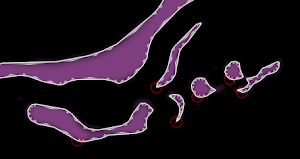 Additionally, left-click dragging will edit the radius associated with the selected corners. For example, in the above picture, the marked verts constrain the bottom left and upper right corners to have radii no greater than one grid unit and two grid units, respectively. 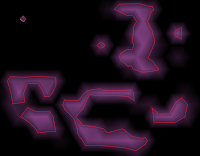 One can also create arc-gons from polygons using the ->arc create command. 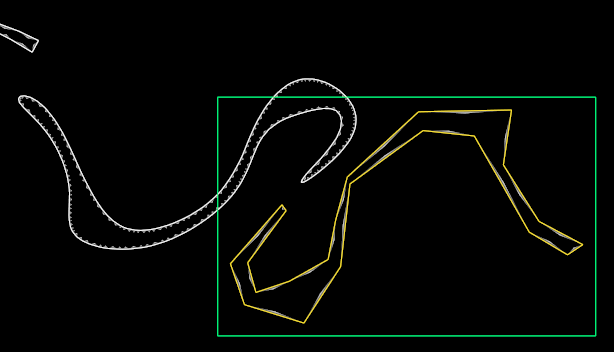 This will convert the current polygon into an arc-gon with zero-radius corners. Here, I've used ->arc on a duplicate of the left ceiling polygon, then smoothed the internal vertices by going into edit mode, selecting them, and left-click dragging. Really, you could just always work with arc-gons, but sometimes you don't want to worry about accidental left-click drags introducing small-radius corners. Another way of creating polygons with smooth corners is to use the subdivision modifier. These look "gooier" and a bit more organic to me than arc-gons. Above -- from left to right -- I've created a poly and modified it a bit; then selected it and applied smooth (space, smooth, enter); and, finally, dropped into edit mode (tab) to adjust the vertices more. Note that duplicating a smoothed poly will give you a copy of the underlying cage, not the smoothed version, and pressing x on a smoothed poly will delete just the smoothing. Our level is coming along nicely. Let's finish it off by creating some geometry with level set painting. Painting is a free-form method of specifying geometry; you draw values into a grid, then extract contours of this potential field for use as level geometry. To start, we'll need a canvas to paint on. Create one by typing paint at the create prompt (i.e. space, paint, enter). This will immediately drop into painting mode. In painting mode, you add material with left-click and remove it with right-click. Red lines show the level geometry that (may) be created from the current paint. 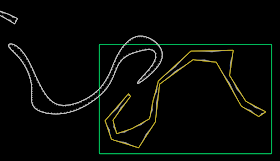 The yellow line shows the outline of the canvas. This will be automatically resized if you paint outside its borders. 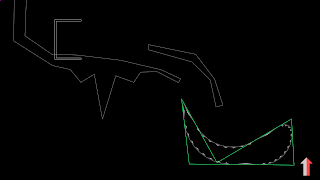 The brush has two parameters, a radius (modify with shift-mousewheel) and a falloff distance (modify with ctrl-mousewheel). The above image shows a few options. The falloff doesn't really do much unless you start painting a lot of positive and negative strokes, in which case it changes (a bit) how the generated geometry moves. If you are painting large areas, the editor can bog down. In this case, you can use up arrow and down arrow keys to adjust the painting grid resolution. This is non-destructive (you can always switch back to an old resolution without a problem). Note also that some simplification is always run on the output level geometry, so using finer grids may not actually change the number of vertices in your level. 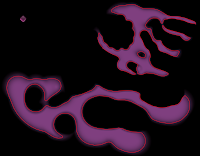 If you have been playtesting your level, you will have noticed that your awesome paint doesn't actually appear in the game yet. This is because you need to create paint polygons to pull information out of the paint. The ppoly* command (i.e. 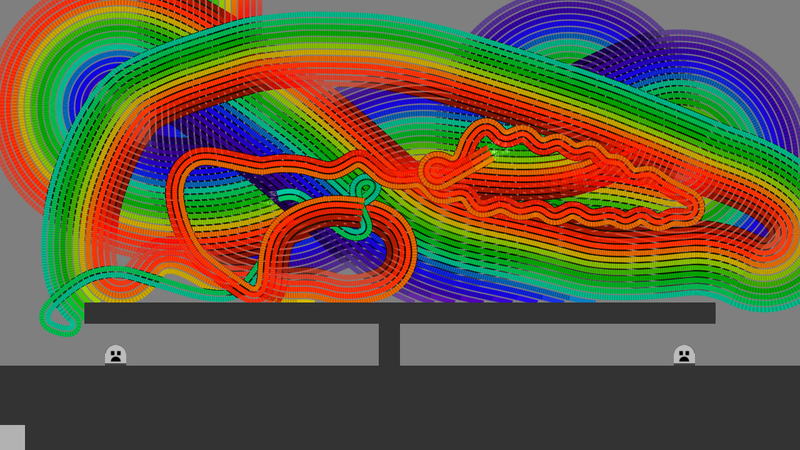 space, ppoly*, enter) creates paint polygons for all contours in the currently selected canvas, while poly creates a polygon based on a seed point at your current mouse cursor. 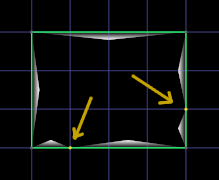 Once created, paint polygons can be grabbed to offset them from their canvas positions, or deleted with x (useful for removing shards). Additionally, changes in the original canvas will be reflected in the extracted outlines. This can be useful for minor edits to platform shapes. 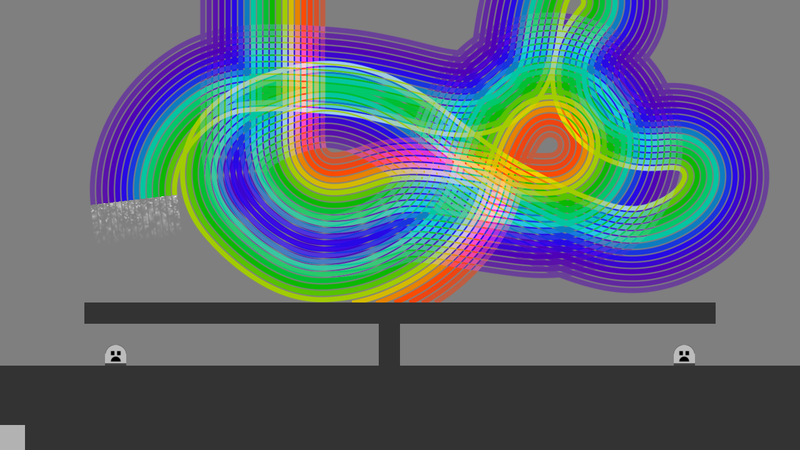 Note that sometimes -- due to, e.g., topological changes in the canvas -- one can end up with multiple ppoly's for the same contour. 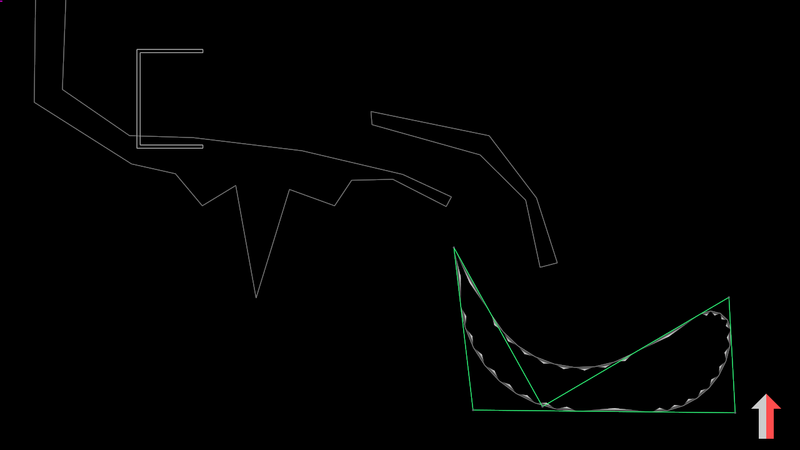 This results in overlapping geometry and is generally bad news for your levels. In this tutorial, I showed you how to use Rktcr's four different types of level geometry: basic polygons, the somewhat smoother arc-gons, the organic looking smooth modifier, and the freeform paint-based geometry. I find that each type of geometry lends itself to a different style of level -- as you'll notice in the game -- but that it can occasionally be useful to mix them up for specific situations. Now that you are familiar with the various ways to create level geometry, it's time to add details and graphical polish. 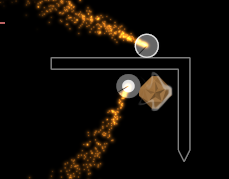 In upcoming tutorials, I'll talk about adding dynamic objects and constraints; working with disruptable platforms and gems; adding bursts; making your level prettier using style layers; and giving folks a par time using claims.